Pam is a lot like any of us. Monday to Friday, she holds down a job as the manager of a local car repair place. Cars come in. Cars go out. She keeps the place busy with customers and makes sure the mechanics are on top of things. It’s the stuff of human productivity with which we have built and crashed an economy, more than once, and for Pam, it is a job. Yet, several times a week, Pam does something else, as part of her formation process to the vocational diaconate – that order of ministry that sets people apart to remain at work in the world so as to be able to speak a prophetic word to the Church about the needs of the world around us. The ‘something else’ that Pam does is to visit people at St. Paul’s senior living facilities in Bankers Hill, San Diego; to hear their stories, to join in their joys and fellowship, as well as to witness their struggles to let go of independent living and accept that their bodies are gradually shutting down. One such person that Pam encountered recently was an elderly woman who was finding it hard to remember the names of her own children. The woman held a pendant with their photographs in it, moving the precious treasure between her fingers as if she were praying the rosary. After some time Pam asked who the people in the pictures were. ‘They are my children’, the women replied, as if it were entirely obvious, yet the names escaped her. All of those years of child-rearing, the nights and days of care and love and week after week of Sunday dinners were now consigned to the dim recollection of closely held images that once had names. There is a reason why they call Alzheimer’s the long goodbye. ‘I love those bubbles in the sky’. ‘You mean the clouds?’ asked Pam. ‘Yes, clouds and that green waving in front of the window,’ pointing at the branches of two palm trees swaying in the wind outside in the courtyard, ‘they are so beautiful, like a wonder. Is that what wonderful looks like?’ And the Holy Spirit thus made her dwelling there among them. Is that what wonderful looks like to you? Of course, one person’s wonderful is another person’s absurd. This week, as I walked down the boardwalk here in Pacific Beach, I saw one man’s version of ‘wonderful’ in the form of a pick-up truck that had a living room couch strapped to the back with umbrella attached for shade for the man and his rather lovely labrador. Now, I don’t know if our pick-up truck friend sits there reading the newspaper while he is being driven around town, but safety concerns aside, it is a wondrous thought, is it not? If that’s not your idea of ‘wonderful’, try this one out for size. 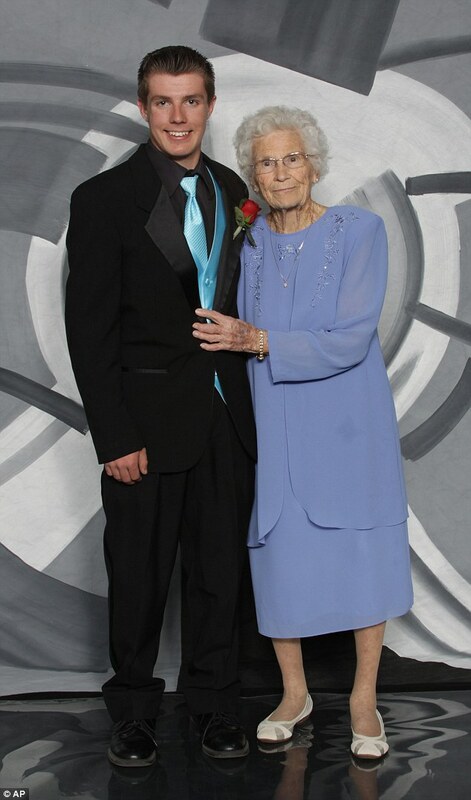 His name is Drew Holm, a high school student who a couple of weeks back took his 93 year-old grandmother to prom. According to the Huffington Post, 75 years after attending her own senior prom at the same high school, Drew’s grandmother and her grandson danced the night away, at least until their self-imposed 9p.m. curfew. When his grandmother encouraged Drew to find a ‘pretty girl’ to take to the prom, he replied that he could not, because she was the prettiest woman he knew. Apart from perhaps having discovered the most sure-fire way of getting high school girls to like him the nation over, Drew’s prom night generosity of heart certainly offers us a gospel for our times. From sharing a glimpse of wonder with fragile souls who are slowly losing their minds, to tripping the light fantastic with your grandmother, or strapping a couch to your pick up truck, Pentecost moments are all around us. The problem is not that the work of the Spirit is in short supply, it is that we are often just unable to see it. Indeed, on that whirlwind appearance before Jesus’ disciples two millennia ago, the wonder of God could so easily have been missed. Surely they are drunk? How could it be that they are speaking like us? New wine, for a new religious movement, which was to be treated with suspicion. After all, dead people do not, as a matter of course, rise from the dead. The challenge people of the Spirit can face, however, is that the wonders of God are hard to talk about. Sometimes it is as if we are like the lady in Pam’s encounter at St. Paul’s Manor, clutching images of love and beauty in our hands yet not quite able to speak the names of such gifts of grace. If that is a struggle you also find yourself having, if you find it hard to put words to your experience of the Spirit, you should not worry because you are in the very best of company. Thomas Aquinas, a genius and one of the most prolific and important theologians in the history of the Church looked back on his massive volume of theological work and likened it to straw in comparison to an experience of the Spirit he had while celebrating the Mass on the feast of St. Nicholas in 1273. Jump back about 900 years to the end of the fifth century and we find another great theologian of the Christian trad ition, Augustine of Hippo, who spent his life trying to put to words the experience he had of constantly seeking out that Spirit of life who had touched his heart, writing an often quoted phrase ‘our hearts are restless, until they can find rest in you.’ Or take the great 18th century Anglican preacher John Wesley, who preached literally thousands of sermons from horseback – a man not short of words you could say – on this Day of Pentecost in 1738, experienced his own movement of God’s holy rushing wind, writing in his journal that the Spirit of God had ‘chased away the darkness of my unbelief,’ leaving, ‘my heart strangely warmed’. In a couple of weeks, my family and I will board a plane for Dar Es Salaam, Tanzania, in search, I believe of our own Pentecost moments. The Church, in its wisdom, makes provision for its ministers to step back in rest and reflection from the work that engages them day to day, year to year, so as to catch a glimpse of the larger picture of God’s grace-filled Spirit at work in the wider world. I only know a couple of words at present in Swahili. One is ‘nipo’, used in the phrase ‘nipo pamoja nanyi’, which can be translated as, ‘I am present’. According to a former hospital chaplain colleague of mine, who is from Tanzania, when two villagers meet on the road, their greeting will be, as they hold each others hands, ‘nipo’ – present; I am here with you. And then they will share all the news that their respective villages have to offer. Such is our intention this summer, to live into the words nipo pamoja nanyi, to live into being present. It is not the most sophisticated of summer plans, but I suspect it will feed us and hopefully others more than we know.